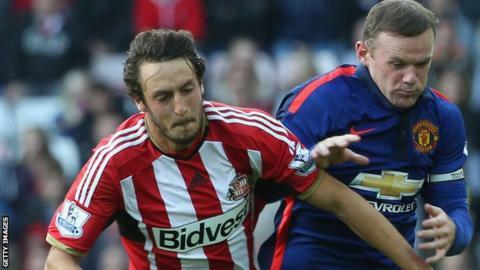 Sunderland manager Gus Poyet says he did not initially think new signing Will Buckley was good enough to play in the Premier League. The winger, 24, moved to the Stadium of Light from Championship side Brighton on 14 August for an undisclosed fee. Buckley impressed on his first start for the Black Cats in Sunday's 1-1 draw with Manchester United. Asked if he always thought Buckley would be a top-flight player, Poyet said: "When I first saw him, no." The Sunderland boss added: "But he was learning, listening. He is very quiet, shy, but with his feet when he is on the pitch and he's got the chance to attack you, he's a nightmare." Poyet tracked Buckley's progress at Brighton for seven-and-a-half months after failing to sign him in January. He added: "He is confident with the position that we play him, he knows what we want from him. When it's clear, it's supposed to be easy. "He doesn't need to make too many decisions, apart from doing what he does best and being in position."